Sewing clothes, albeit with a pattern, is actually how I learned to sew many, many years ago. There are many, many halter tops back home (Kathleen, Georgia - holla) that I made from my mother's fabric and patterns from the seventies. But I digress. My point is, I still have not dared to really dig into apparel, save for taking in lengths or making the simplest of tubes. Obviously, I should try and alter some pants. I can't say I know what I'm talking about - I know how to hem and how to stitch but nothing of tailoring to the curves of a body (ooOo). I just know what I did and here I'll tell you. I do very much love my fitted, goldenrod, Betty Draper pants. What these lines mean, after the jump! Above, on the left, we have the before-and-a-half (because at this point I'd already started messing with one of the legs) and on the right, the after. These pants are a light weight linen and I scored them for about $5 at a Goodwill. Most important part of trial-by-error altering is a $5 investment. I have no idea who owned these before or what they were intended to look like on someone. I probably wore them as they were for a year, they were still high waisted and tapered and yellow - and that ain't bad in my book. But I saw a greater potential for a more fitted and even more retro of a pant. Eighty percent of the process involved putting on the pants, making a mental note of what areas were big in what way and then taking off and marking them by hand with tailors chalk. I drew new curves in my artistic ability (I actually have this, thanks Devin!). Really, I used the existing seam's curves to judge how to adjust my new curve - this is where the trial-and-error comes in. I set my sewing machine to do a very wide stitch - one that would be easy to pull out if (and most likely) I needed to - importante. I just took in from the outside of the pant. I worked on one leg and when I had it like I wanted, I copied it to the other. A The back of these pants are actually elastic which was forgiving of my waist adjustment. Instead of un-doing the waist band I decided to continue the inside seam all the way up. I decided to do this because the fabric is so light weight it would be pretty un-noticeable and well worth skipping all the work that re-doing the waist band would involve. I actually almost didn't take in the waist at all until the last minute and I'm ever so glad I did. It really straightened up the fit of the band at the top and made the pants look that much more tailored. B This was the hardest spot to get just right and I have it - just right. This curve (though not much of a curve on me) from the high, high waist to the thickest part of your thigh is not found in many-a-pant these days. If I gain so much as half a pound these pants will be too tight across the front. Motivation! C The ankle was actually the part that I made the biggest initial misjudgment on and had to pull out some stitching. Elizabeth says I have dainty ankles, but I could barely get them through my first go-round. 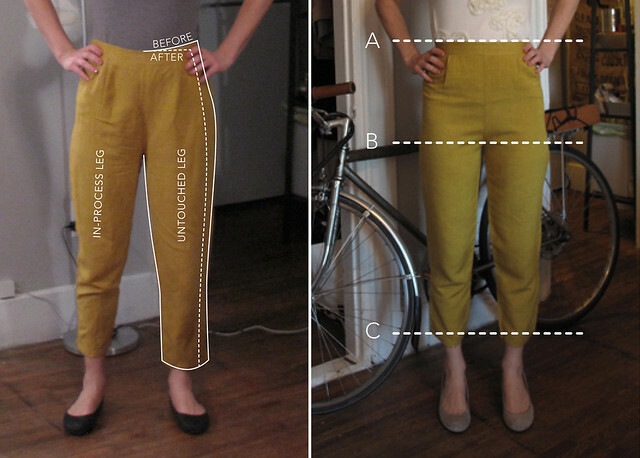 These pants had a basic hem with a 1/4" fold and another 1" fold, topstitched. You'll want to pull out some of this top stitch to open up the fabric and bring your new side seam all the way to the end. I don't know if this is really of any help at all, this might not work on all types of pants - these are certainly a special style - but perhaps it will encourage you to spend $5 to take apart something and see how it works. I feel I've got a much better understanding of the construction and form of a pant now from this and am excited to try my hand at shaping up something else! I LOVE THOSE PANTS. And they fit you wonderfully now! You make me realize that I really need to learn how to sew..
You did a FABULOUS job of altering those pants. What a great color, too! Thanks for sharing your pointers -- I can't wait to try my hand at some altering now. Wow - these are wonderful! A great reminder to see the potential in things. The color is fabulous and the new cut is so flattering. Great job! Love what you did with them, and the color is great. Also would be interested in knowing where you got your grey heels. They appear to be the perfect height. Bummer! But thanks for the info! I'm always jealous to hear when people come across good Target finds.